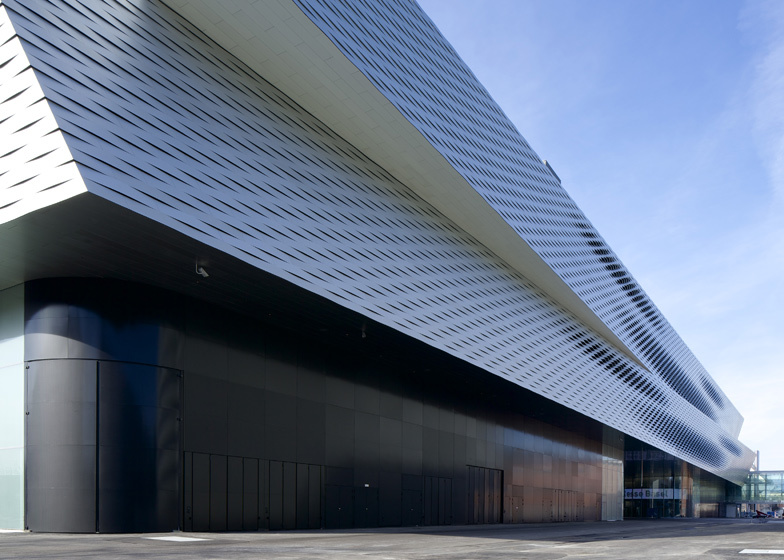 Herzog & de Meuron has added three new halls to the Messe Basel exhibition centre in the north of the Swiss city where the architects are based (+ slideshow). 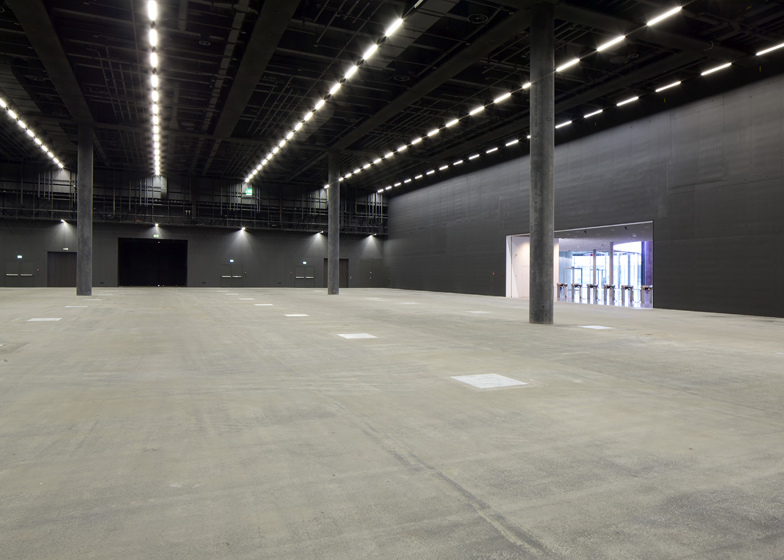 The Messe Basel, which hosts Art Basel each June, is undergoing a development programme to relocate exhibition areas around the neighbouring Messeplatz public square, so Herzog & de Meuron was asked to replace two of the existing halls with a new extension. 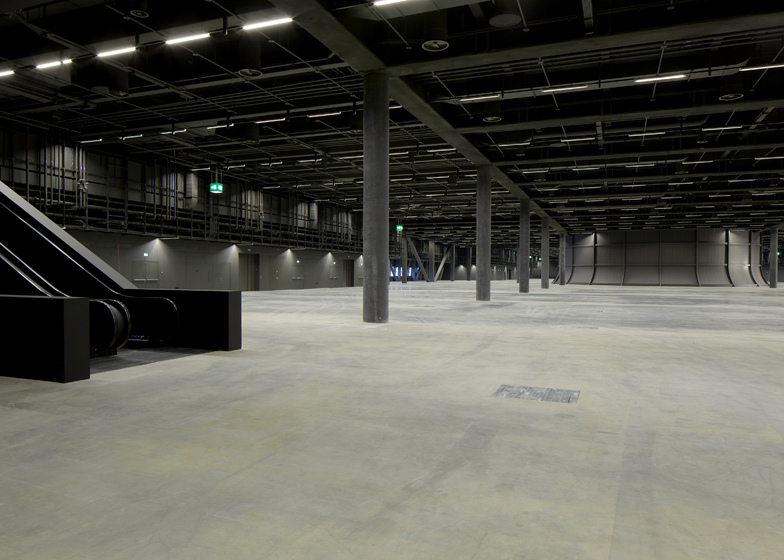 The architects have stacked three ten-metre-high halls on top of one another, creating a 2500-person events space on the ground floor and two additional exhibition rooms above. 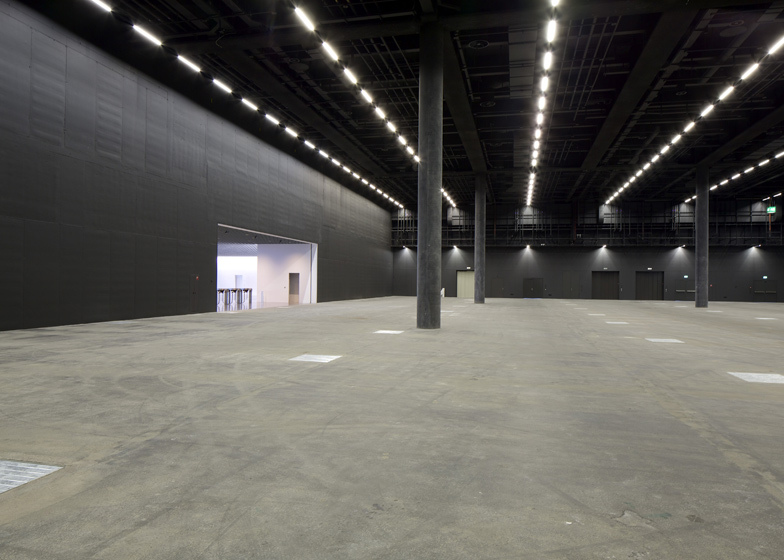 Externally, these halls appear slightly displaced from each other. 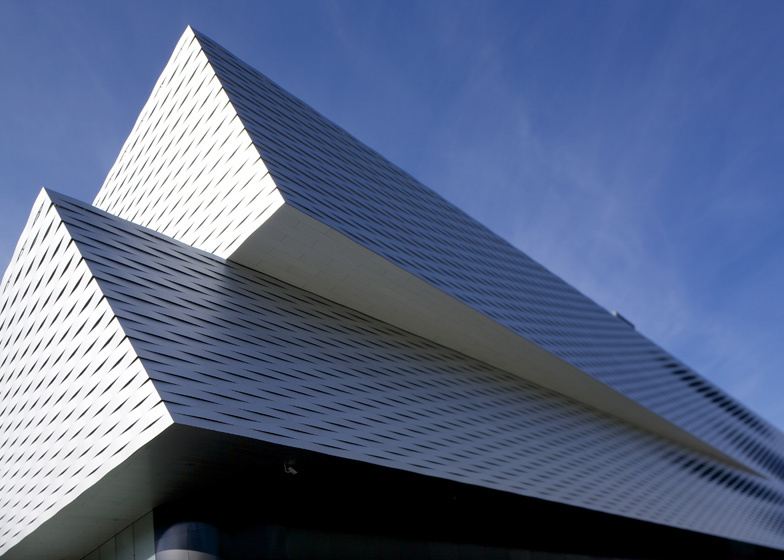 Textured aluminium clads the exterior, creating the impression of a woven facade. 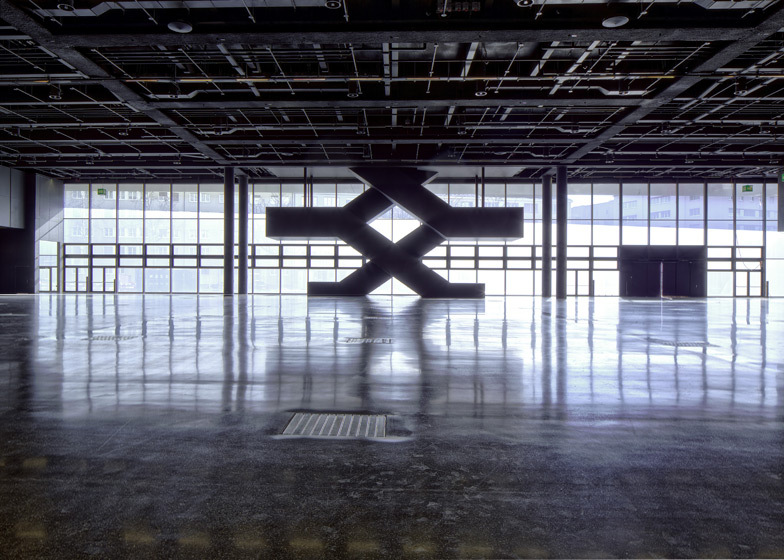 Each hall features a wide-spanning construction to reduce the number of columns, while zig-zagging elevators provide a link between each of the levels. 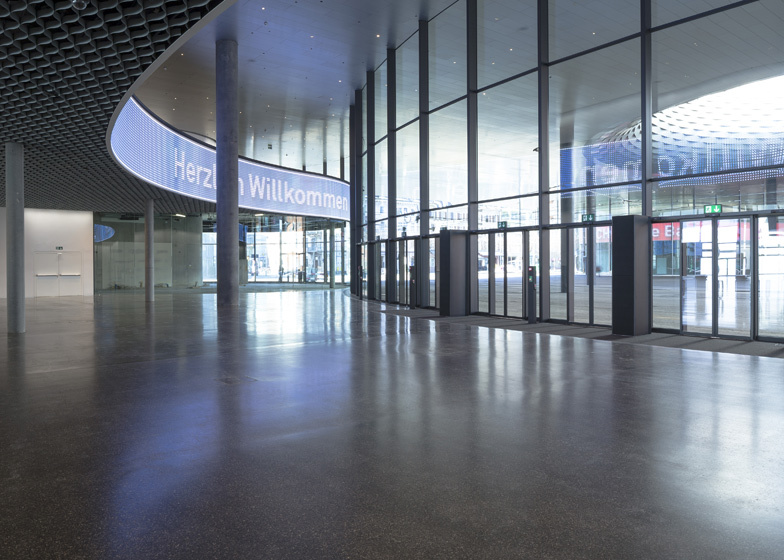 A ground-floor lobby connects the extension with the existing exhibition halls and a series of shops, bars and restaurants. 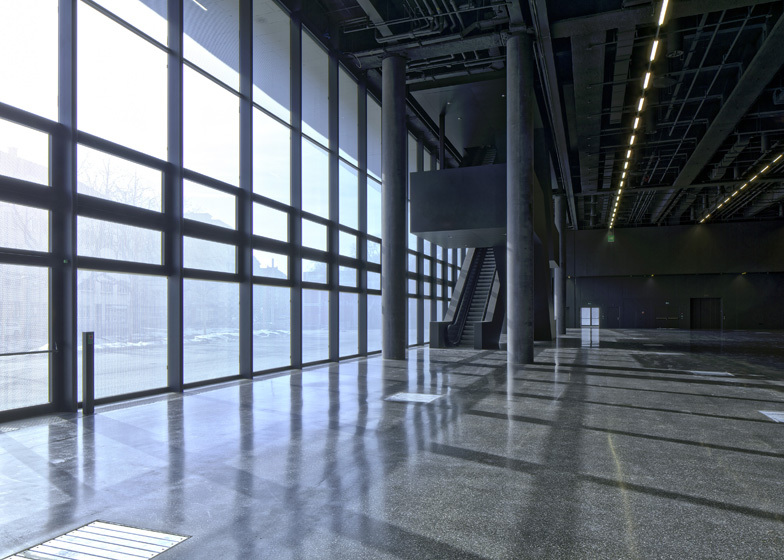 Glazing surrounds the facade to attract as many visitors inside as possible. Part of the extension bridges across the Messeplatz and creates a sheltered area that has been dubbed the "City Lounge". 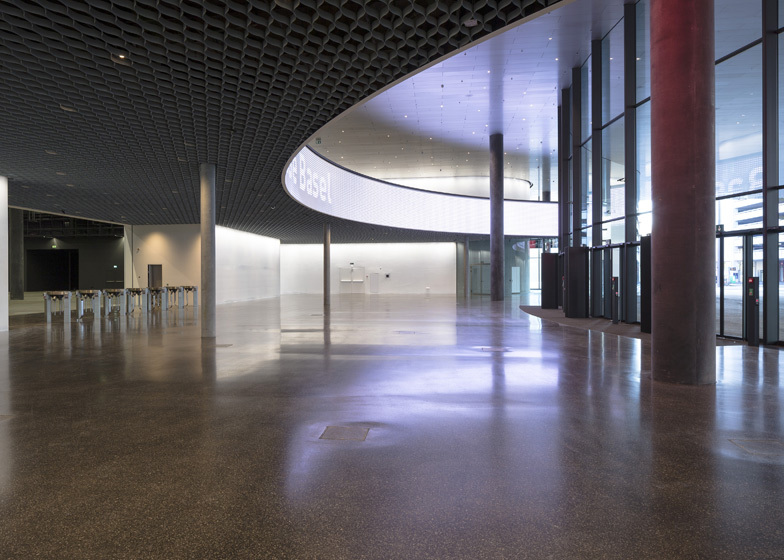 A large circular skylight punctures the roof above the space, framing the main entrance into the building. The New Hall will be officially opened on the 23 April and the old building will be redeveloped and converted into apartments and offices. Herzog & de Meuron, led by Jacques Herzog and Pierre de Meuron, also recently completed the Parrish Art Museum, an art gallery on Long Island, New York. See more architecture by Herzog & de Meuron, including interviews we filmed with both architects at the opening of the 2012 Serpentine Gallery pavilion. Photography is c/o MCH Group AG. 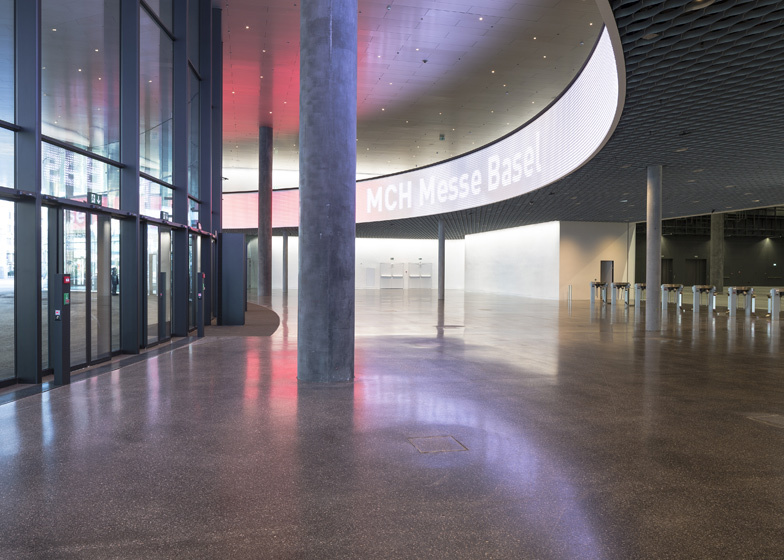 The New Hall of Messe Basel is complete. 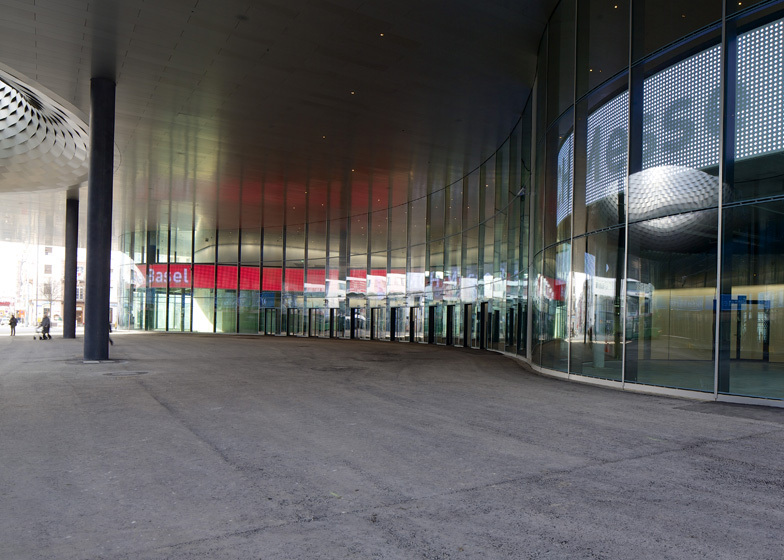 Its realization is a key development in the Messe Basel's aim to concentrate its exhibition halls around the Messeplatz (Exhibition Square). 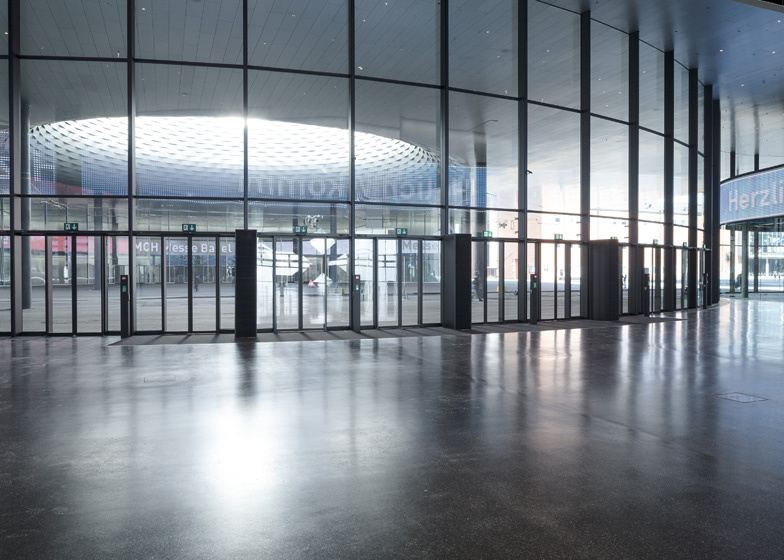 The surrounding Kleinbasel district will also benefit from the continuing upgrade of the Messeplatz and, at the same time, regaining former exhibition areas to convert into apartments and offices that will contribute to Basel's urban development. 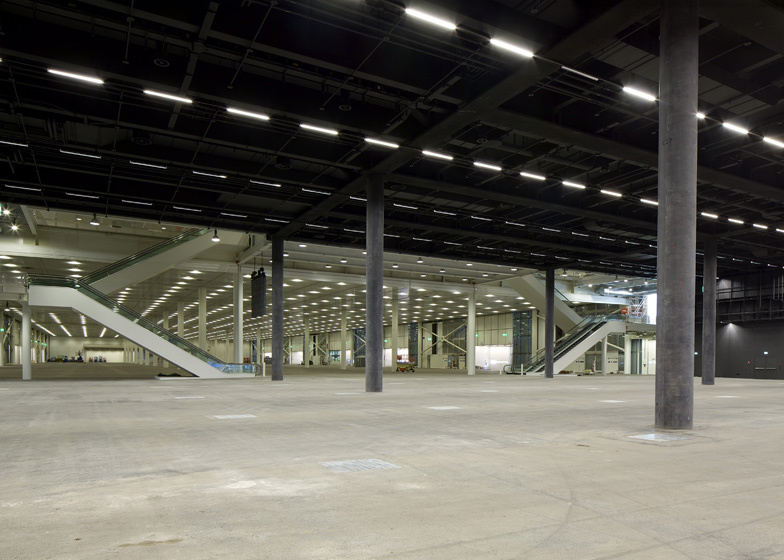 Replacing two out-of-date halls, the new three-storey extension offers modern, flexible and versatile exhibition spaces with wide uninterrupted spans and tall 10m heights. The New Hall features three levels. 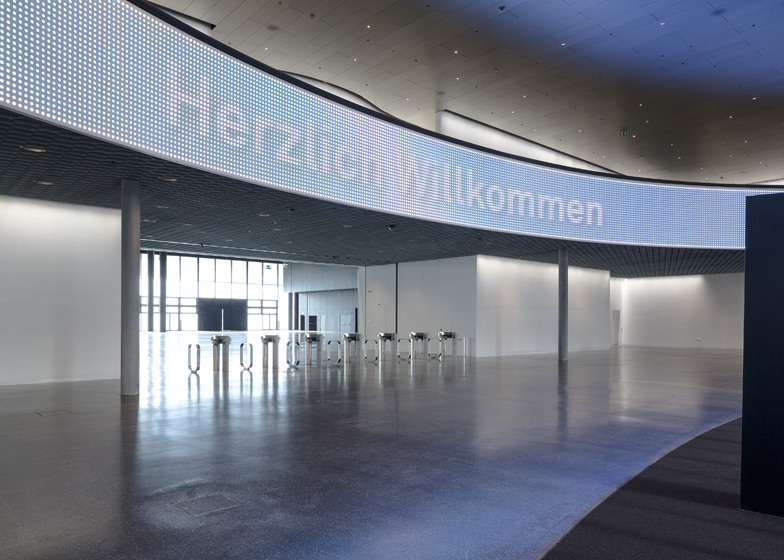 The ground floor entrance level seamlessly links the City Lounge to the existing halls, the new event space for 2'500 spectators, and a number of shops, bars and restaurants. 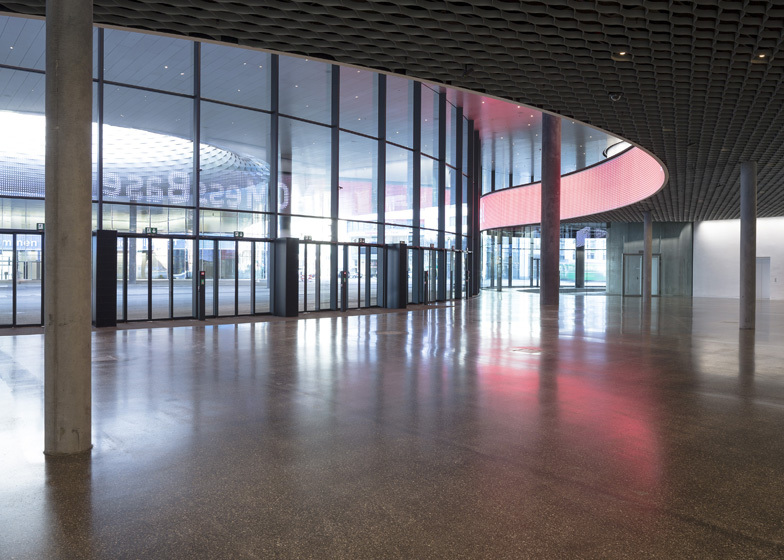 The dynamic sweep of the street level facade reacts to the flows of people and corresponds to the space required at the tram stop and entrances to the exhibition centre and Event Hall. 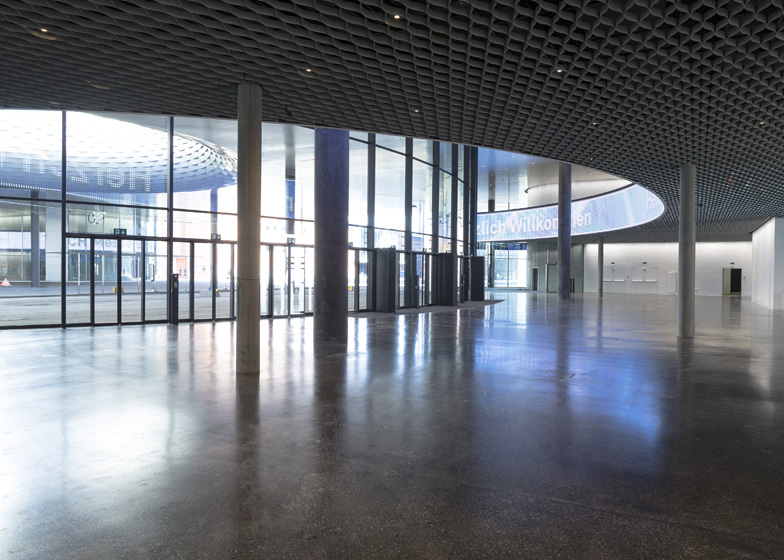 Here, large expanses of glass create the spatial transparency both necessary and appropriate in order to achieve the openness envisioned for the exhibition hall complex and the enlivening of public urban life. 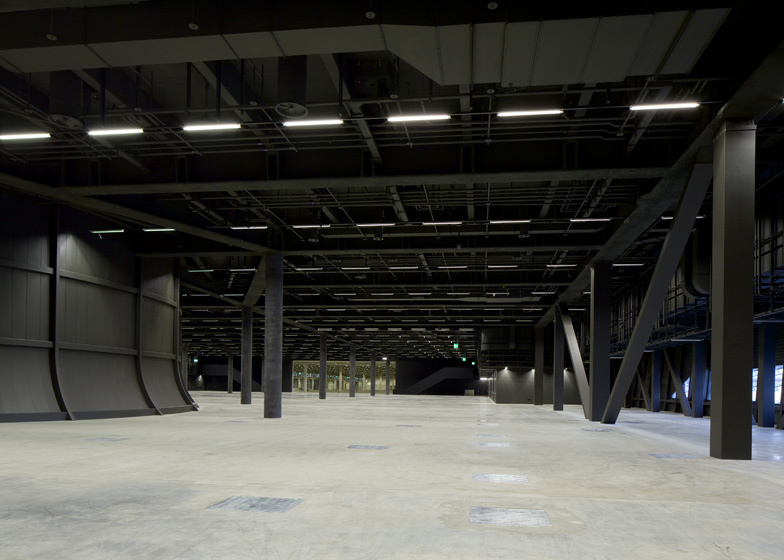 The two upper exhibition levels are offset from each other as separate volumes allowing them to respond and shift to specific urban conditions. 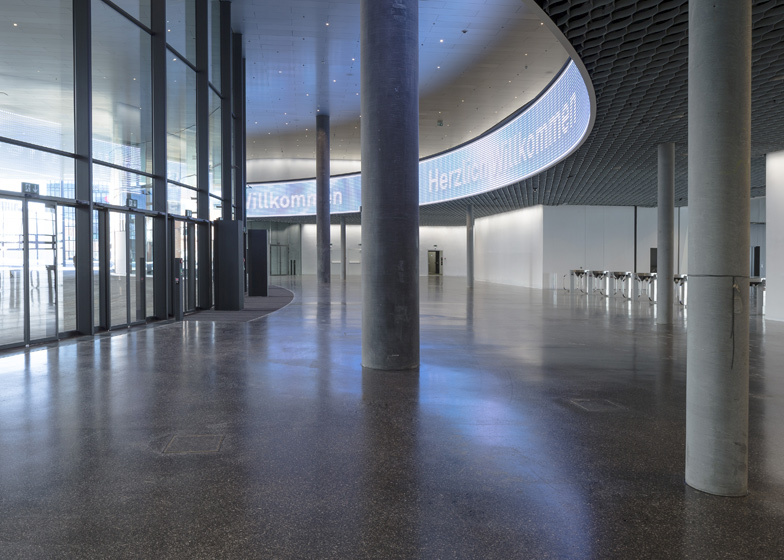 From each point of view, the new hall offers a different perception and thus avoids the repetitive monotony typical of exhibition halls. 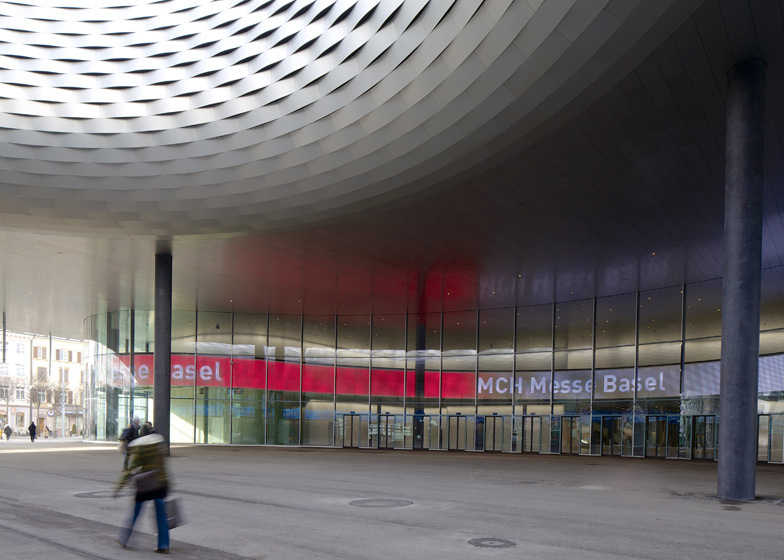 This constant architectural variation is reinforced by applying a homogeneous material (aluminum) over all exterior surfaces. The facade of articulated twisting bands strategically modulates and reduces the scale of the halls large volumes to its surroundings. 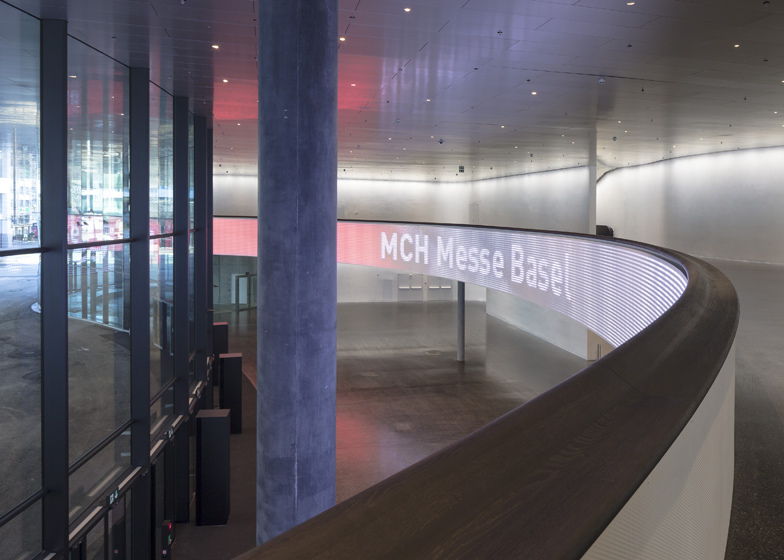 This is not simply a decorative element but a practical means to regulate the fall of natural light on adjacent properties and to provide views in to the new hall's social spaces and out towards specific views of the city of Basel.